So You Think You Know How to Run a Seder? Okay. So you think you know how to run a Seder, eh? How about updating it a little into the 21st Century; like, say-how it would look on Facebook, for instance. Or, what if you're in grad school, and you are reading the Haggadah? Well, thanks to Carl Elkin, welcome to The Graduate Student Haggadah. I don't like Pesach cleaning. 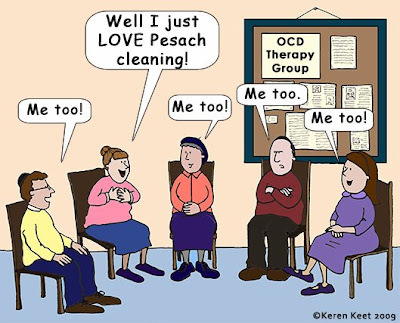 Even though I found this cute cartoon (below) on Jewlarious, and I do have some OCD tendancies (don't worry-I'm working on myself), I still do not like to clean for Pesach. Bottom line is, it's physically daunting, I get overwhelmed with all the papers, articles and what-nots that I've saved over the years (a packrat, am I) and, combined with my natural laziness, it just doesn't cut it. But truth be told, I found some really interesting things while I was cleaning the sifrei kodesh bookcase and books. My problem is, I sit down and start reading and thinking about the past, and my parents (ob"m), etc. and get into a sad mood, and the cleaning stops dead in its tracks. I am sitting here at my old 512 MB of RAM computer which is held together with chewing gum and scotch tape (they don't say that anymore, 'scotch tape.' Only in Israel...or is that the Israeli word for "Velcro?") at 10:11 a.m. MDT (-going in to work later today), reading the latest Haveil Havalim #209 at What War Zone with its aggregate of great blog posts, lamenting the fact that I haven't blogged since Purim. A Purim Demise, a Purim Reprise...boo hoo - hee hee! My younger son (Nathaniel Blumenstein), reminded me of Purim last week when I heard he was rummaging around in his Jerusalem kitchen for his Abba's star iron, in the hope that we left it there last Purim, when we traveled to Israel for his older brother's (Mister Arnold) wedding. You see, we had taken it with us, knowing that since we were returning way too close to Purim (two days), we would never have the time to stand over a hot deep fryer, sweating away frying our Famous Purim Stars in boiling oil. So, clever beings we, we took our Purim Star paraphernalia with us to the Holy Land, and actually made our Purim stars at yon younger son's postage-stamp-sized apartment, in his teeny weeny alcove- er-kitchen. Actually, he made them, and did a great job of it, too. These Purim stars, deliciously crispy, made from a yummy batter of milk, flour and eggs--were the delight of our family since our Texas days, almost thirty years ago. It's About Time for "From Time Immemorial Part IV"
I posted the first three segments of the Zola Levitt interview with Joan Peters a while back, ending with the third segment in the beginning of February (scroll down to find them). It is now time for part IV, where Ms. Peters talks about, among other things, the "massacre" in Jenin being a total lie, the fact that Arabs who consider themselves 'Palestinians' can consider Jordan, which is 80% Palestinian, because it is a major part of the territory called "Palestine," and where selling land to a Jew is still punishable by death; about the death-grip that the oil-rich Arab countries have on the United States because of our dependence upon their fuel, and many more things which shed light on the true situation of the Arabs vis-a-vis Israel. Listen, and learn. And read her book. So, some of you want to show your displeasure with that terrible, inhumanitarian, terrorist state of Israel by boycotting Israeli industries or products? Because Israel, of course, has only done bad things to the so-called Palestinians, wait--and I forgot the rest of the world--it hasn't done much of anything for them, either. Israel is just always-well-there- with it's annoying Zionism, annoying smart people, annoying love of life. Gosh, they're so annoying, it's no wonder you want to boycott them! My friend Naomi is a physical therapist in Jerusalem. Some time ago she sent me the story of one of her patients, Odel, a 13-and-one-half year old girl with a terrible disease, who would be happy if she could just have a special chair, to help her live as normal a life as she is capable of . . .
Naomi sent me a letter in Hebrew, which I translated (with some 'poetic license') below. Please, if you can, do a mitzvah* and help her to help her patient, by commenting on this post (leave me your email address and I will reply) and telling me of your willingness to help.You can also email me and/or Naomi, whose email is in the letter below. I left out other personal details 'to protect the innocent,' but if you are genuinely willing to help, I will give you some more details, as will Naomi--in our replies.